This Finder bug has irritated us for over a year, but Apple seems unconcerned about fixing it. As Apple prepares to sweep into its annual Worldwide Developers Conference, things couldn’t be looking better. Sales on everything apart from iPads keep going from strength to strength. The Watch is still outselling supply. Millions of fans out there are poised to rush out and buy the next products, whatever they might be. But Apple’s self-transformation from design-geek computer manufacturer to preferred supplier of consumer products may be in trouble. That sleek Jonny Ive exterior is struggling to cover over the same internal faults of old Apple. Let’s start with the Mac. Although unquestionably the best-designed computers on the planet, Macs rely on OS X, but users cannot rely on Apple to make OS X reliable. The most overt unfixed problem in OS X, for instance, is the long-standing bug in Finder which sometimes puts its column views into absurd widths. This has irritated users since Mavericks, for well over a year, but still pops up with annoying regularity. Internally Yosemite still creaks and groans too. I wrote about strange problems with the new discoveryd service here. Six months on and latest reports are that Apple has dropped it altogether and reverted to mDNSResponder in the latest beta release. These are major changes at the very heart of OS X, affecting the vital feature of network connectivity, which appear almost arbitrary. Issues are not confined to Apple’s oldest product lines either. Although the Watch has some amazing features, for the next few months users will continue to struggle to access them, because Apple will not yet allow third-party developers to create their own apps which run on the Watch. Although we were all told how many apps supported the Apple Watch when the first products shipped, what was not made so plain was that only Apple’s apps could actually run on it. All other developers, relying on Apple’s Xcode development environment, were forced to produce rather pallid Watch-hosted interfaces to their iPhone apps instead. Apple’s Workout app can access heart rate measurements, but those from third parties are locked out until the Autumn. In some areas this has prevented the Watch’s software from enabling its hardware. I have already written about this with respect to the heart rate sensors here. So for the time being major fitness apps such as Nike+ and Strava are unable to acquire data from the Watch’s heart rate sensors. 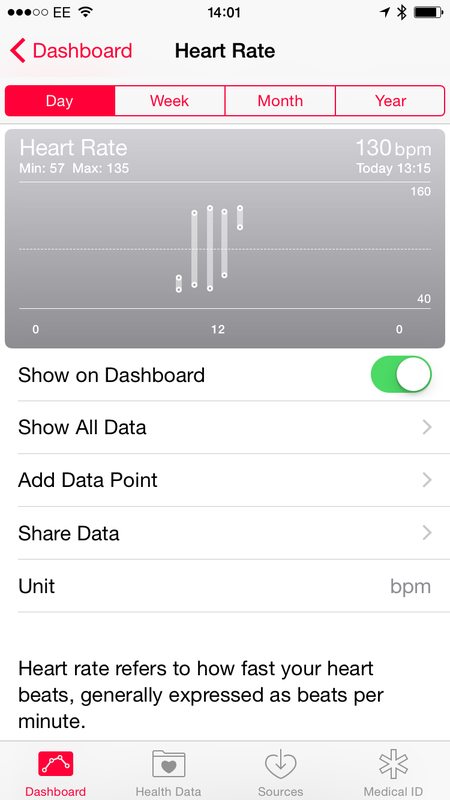 Viewing heart rate data in the Health app is not useful for those interested in fitness training. This makes no sense, because Apple’s own apps do not do much with heart rate data anyway. The Activity app is geared to some Californisthenic exercise regime and has you jumping up to stand for a minute every now and then. 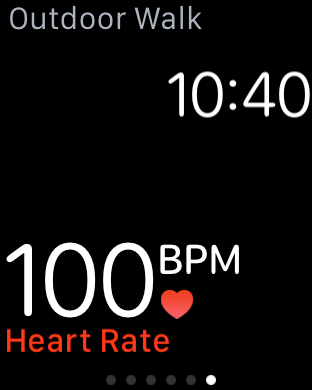 The Workout app tells you your heart rate and logs it into the Health app, but locks it away there so that you cannot even display it in sensible graphical form. If you are really determined, you can archive your entire health data and mail them to yourself as a Zip file, but when you open that you will find that it is all stored in an idiosyncratic XML format which is going to take hours to unscramble. It took a third-party developer to produce QS Access, an iPhone app which exports data in more accessible CSV format, but even that is somewhat clumsy. An end to this lockout is in sight though. In an interview with Walt Mossberg at the Code Conference, Apple’s executive in charge of the Apple Watch, Jeff Williams, confirmed that the Watch development kit would be released to developers at the Worldwide Developers Conference in early June, but that third-party Watch apps would not be made available until the Autumn, according to this account in MacWorld. So those who bought Apple Watches thinking that they would be able to use them with apps like Nike+ and Strava will have waited more than 3 months before Apple allows them to. These examples illustrate how Apple appears less dedicated to delivering function in its products, despite being obsessed with their design. In each case, either insufficient resources have been deployed to tackle a problem, or the project tackling it has been poorly managed. Apple therefore needs not a Chief Design Officer, but a Chief Function Officer. They also raise questions about Apple’s understanding of consumer markets. Consumers do not like being treated the way they were in the bad old days, when brilliant ideas were being launched on users when they had major flaws or lacked key features. Computer geeks might enjoy works in progress, but consumers expect products to work, not having to wait several months before their £700 watch shows them changes in heart rate during a workout, or their £1500 iMac connects reliably to the Internet. Posted in General, Macs, Technology and tagged Apple, design, function, Mac, OS X, Watch. Bookmark the permalink.